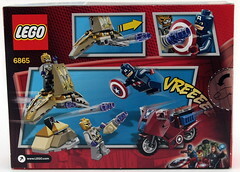 Some might see having Captain America as the only hero in the smallest set odd as he's supposed to be the team leader and that means the only thing he can assemble in this set is his "Avenging Cycle". It includes an iconic hero, generic villains and some vehicular tidbits thrown in to round it out, but does the battle pack equivalent of the Marvel line actually live up to the concept? There's a lot to consider when you look at this set, so buckle up and let's take it one step at a time. It's been mentioned before that these small sets are all about the figs. The pricing is based on that and not the piece counts, so let's forget about that and move on. Most people will agree the reason for buying these small battle packs is the minifigures, so they either need to have plenty of recognizable characters/exclusives like the Harry Potter 4865 Forbidden Forest or cannon fodder for army building like 7914 Mandalorian Battle Pack. This pack is neither and both at the same time. On the one hand you get possibly the most iconic member of the Avengers, Captain America and on the other you get a couple of alien soldiers who are basically part of a near limitless invasion force. If you have any interest in amasing Chitauri soldiers so your Avengers can have an army to humiliate then this is the set to do it, but you're going to pay a price. I know Cap isn't as popular right now as Iron Man, the movies have slanted folks over to team Stark and the comics, cartoons and toys all reflect that. Regardless, Cap is a solid figure that looks great and can carry a set on his own. The printing is good without being too detailed and the darker blue colouring matches the movies well enough while staying in LEGO's established palette. The best bit is the shield and I think it's worth buying multiples just for that. 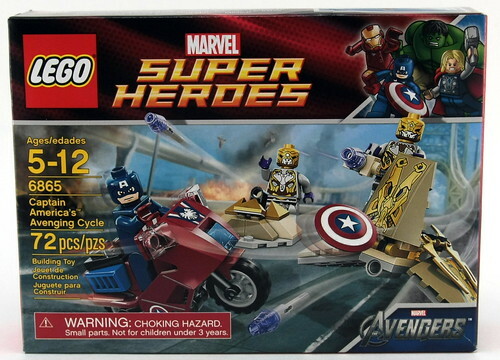 People gave the 6858 Catwoman Catcycle City Chase a hard time because Batman didn't come with a standard cape, but if there is a figure that is nothing without its accessories, it's Captain America. That shield is probably more recognizable than the the character himself and they nailed it. So the good guy side of this set has an exclusive (so far) minifigure that while is desirable, is not something you want to end up with twenty of, unless you plan on clearing them out on Bricklink. The bad guys in this set are so generic they are virtually indistinguishable from one another, so LEGO probably didn't need to bother making two different figures. Sure there are differences when you look at them on screen, but they are the same differences you'd see looking at any army. The Alien Foot Soldier below is actually in the 6869 Quinjet Aerial Battle, but it's much cheaper to get multiples in this set and the Alien General doesn't look so different that you could just throw a bunch of each together and call it a squad. All three figures have back printing and if you wanted too, you could probably get away with reversing the torso so you could have four different Chitauri "uniforms" and the torso/leg printing would match up fairly well. Cap has no leg printing so it makes him at least useful for some dark blue body parts if you need another rationalization to buy multiples. Moving on to the actual build, let's look at the Chitauri side first. 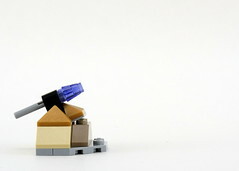 You get two small builds, a speeder and a missile launcher/mortar. The speeder is about as close as they could ever get at that scale, period. Those little ships were so organic that the pilots were strapped in and the gunners were chained on and at times it's difficult to see where the slave/soldier ends and the vehicle begins. It's a nice little parts assortment of mostly tan with some small pearl gold and purple accents that are nothing to write home about. It's a shame that all of the detail of the ship is achieved through the three stickers on the curved pieces, but as I said it needs to look organic and this thing is small. Not an easy task, but considering that the designers most likely only saw initial artwork at best for these I'd say they made it work. The mortar is basically a tiny tan and stand used to fire some flick. I have no strong feelings for these little missiles either way, but I've never had any trouble getting at least 12-18 inches of range out of them. The sturdy design of this little stand allowed for my son and I to shoot those suckers a good three feet. It's a nice little addition if you're building an army, even if this type of devise was not in the movie. I think the extra parts would have been better used extending the length of the speeder to fit the second soldier like in the movie, but as I said the designers may not have even been aware of that. I wish I could say I've left the best for last, but this is really the sore spot for me when it comes to this set. The Avenging Cycle. Stupid name, but it's no worse than Catcycle or (let's be honest here) Batmobile. I know I'll catch flack for that, but it's true. Batman himself simply called it "the car" most of the time, but it needed a name and that was what they came up with. Even Fantasticar is a better name than that. 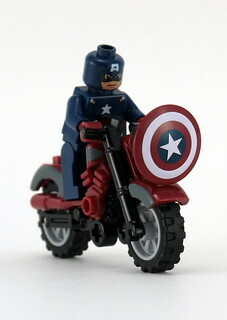 Anyway, the bike they've given Captain America has three main problems. 1) It's not the bike he rides in the comics. 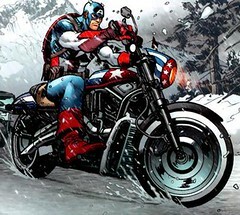 Captain America has driven a Harley Davidson motorcycle since at least 1980 and I know this because that's around the time I started really getting into comics. While not every artist drew it the same, no one drew it like a street racing crotch rocket. 2) It's not the type of bike used in the movies this set is based on. 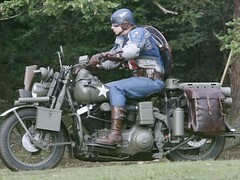 He drives a Harley Davidson Liberator in The First Avenger, so the designers probably figured he'd get an upgrade in The Avengers and he did. 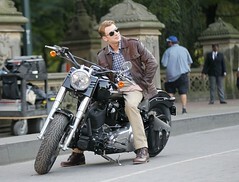 In the new movie Steve Rogers drives a beautiful new Harley Davidson Softail Slim. The worst part is that it does match a motorcycle from the movies. 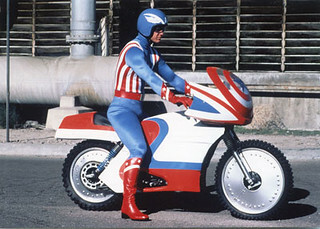 He drove a similar bike with an even worse colour scheme in the horrible 1979 TV movies, Captain America & Captain America II: Death Too Soon. Here is a picture of the bike, if you haven't seen the movies... don't. Seriously, just don't. They make the 1990 version with Matt Salinger look like the freakin' Godfather. 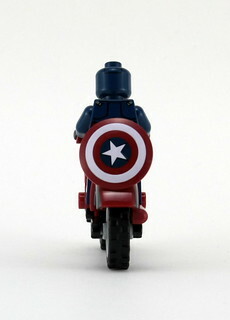 3)This is not the bike that Captain America would choose to ride. Even if it was a bike designed and given to him by SHIELD, certain characters (Fury, Coulson) wouldn't have let this slide by. 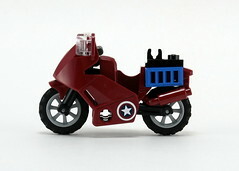 Let's take Harley's out of the equation and focus on LEGO bikes only. 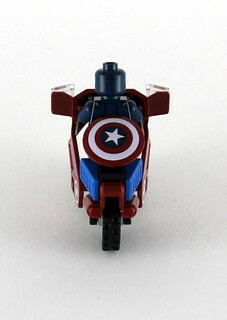 THIS IS NOT THE BIKE CAPTAIN AMERICA WOULD CHOOSE TO RIDE. 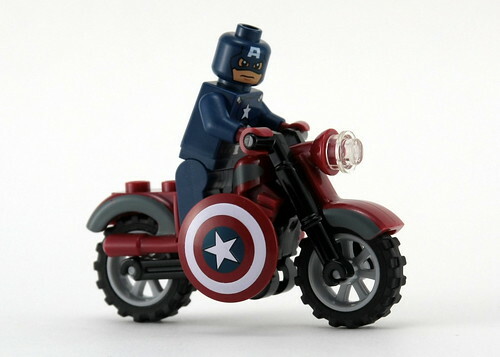 Just look at the most recent selection of LEGO bikes and think "Which bike would a Super Soldier from WWII want to drive if he were made of LEGO?". It's stupid really, they had the perfect bike and one that already came in the right colours. 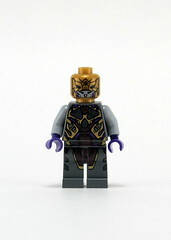 The only reason I could see for not using it is that it appears in the Wolverine set. I guess it just made sense to give him Catwoman's bike instead. Foolishness. Captain America is an absolute must-have to complete the Avengers and well worth the price of the set. 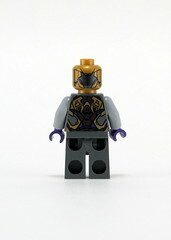 The Chitauri are generic enough to build a small army, but different enough to mix it up a bit. 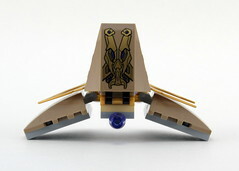 The speeder is simple but descent enough to act out a scene with a couple swooshing around. I would buy this set for the shield alone. 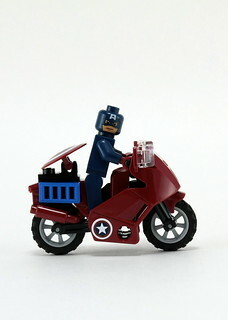 That bike just doesn't jive with Captain America as a character, the movies or even the set it's in. The mortar is pointless and unnecessary, but at least it works (+ tan). I want an Agent Coulson fig. All sets will lose points until it this happens. Vedict: Buy it. Why wait? It's (relatively) cheap, it has the exclusive Cap figure and without it the Avengers have a Chitauri army of one to fight. I've capped off (excuse the pun) three orders with this set to get to $50 so I could get Exclusive Hulk figs and to be honest, I see myself picking up at least a couple more. If I don't have at least ten aliens for Cap to fight, I won't be playing Avenger for very long. Just give him a decent bike. Please, think of the children. I just built this set last night and I gotta tell ya - once I was finished, I looked at it and asked myself "really? THAT'S what's passing for a $13.00 set these days? There's nothing here!" So, yeah - I feel a bit ripped off by this set and, quite frankly, I think Lego planned this. Putting Cap in only one overpriced set so, if you want the whole team, you HAVE to buy it. Look at what you get for only a few bucks more with the Wolverine Helicopter set. Much more substantial, in my opinion. If this were $9.99 I wouldn't feel so ripped off. Yeah, I definitely agree about the bike. 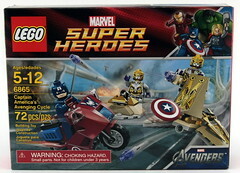 Maybe they give him that one because it's the same one they use for the Police sets, and Cap's a good guy so he would ride a cop bike? Nah, that's stupid. I'm gonna give Cap Mutt's Harley from one of the Indiana Jones sets. 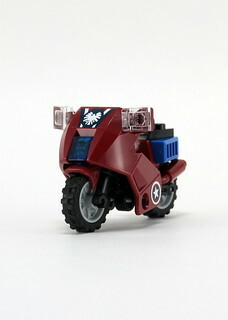 You know who does look like a better fit for the Avenging Cycle: the daredevil CMF from series 7. Give the bike to that guy and put Cap on one of the better one's like Wolverine's or the motorcycles from the Indiana Jones sets. Hiya guys. I'm new here. I reviewed this set from a UK perspective about 6 weeks ago, and pretty much agreed with what was said here. Only, of course, Captain America is not that big in the UK so I scored it a 5/10. Not sure if I'm allowed to post a link to my review so I will, but I understand it it gets removed and I won't do it again if it does. 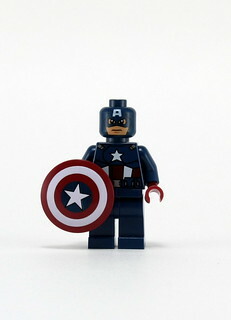 Am I the only one that really dislikes the Captain America figure? Honestly, I think the dark blue is just too dark and obscures much of the detail- a brighter blue may have been more inaccurate to the film, but would've popped more on the figure and brought out its strong points. And the Iron Man helmet may be ugly and oversized and all, but it does show why this alternative- the mask printed onto the face- just doesn't work. It just looks out of place compared to the rest of the figures, and I honestly think a printed helmet of some sort would've worked better (plus, the face underneath would've been useful for making other figures as well). I am also not crazy about the Cap set. It should have been a WWII Captain America set, not Avengers. My only real theory is that there was some licensing issue with Harley Davidson, or the mold was not as readily available (both of which are highly doubtful). 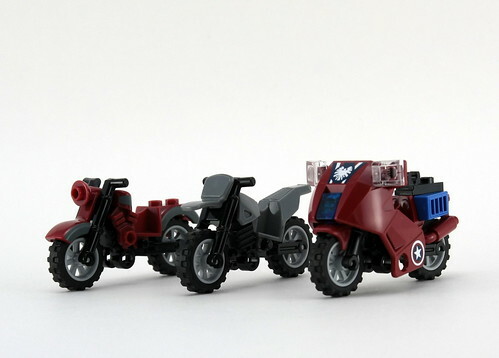 It so obviously should have been the IJ Harley motorcycle rather than that stupid racing cycle mold. I also agree with Flynn. 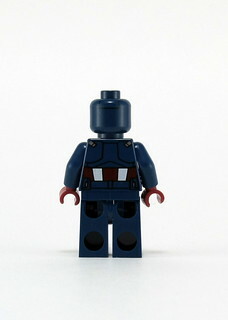 I am not loving the Cap minifigure. The dark blue and black cause my eyes to mix them together and detail is lost. I also dislike the head. My shield is slightly misprinted to boot. Sort of trailed off there GIR3691. If you think the bad guys are awful blame Disney & Marvel, I think the figs are about as close as you could get in LEGO's cartoonish blocky style. 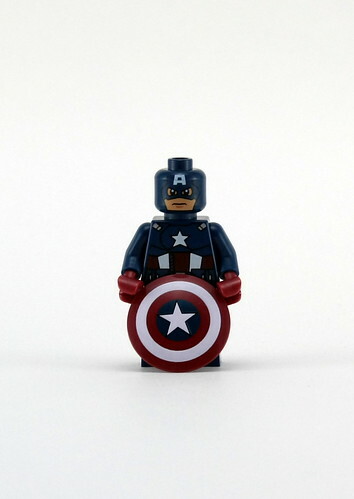 You boys have two main choices for LEGO blue and while neither are a perfect match for Cap's uniform in the movie they went the right way imo. The regular blue would be fine for a comic version of the character if they did one down the road, but as far as the head goes this is the only way to do it. His cowl is form fitting and I know Batman's is as well, but if they make a helmet mask for him he would look ridiculous next Spider-man, Deadpool, Iron Fist and any other masked character they bring out who wears a skin tight head gear. If they wanted to make a WWII Cap with the costume shirt, leather jacket blue USO helmet and original shield I'd be all for it, but otherwise it needs to be printed to look right. 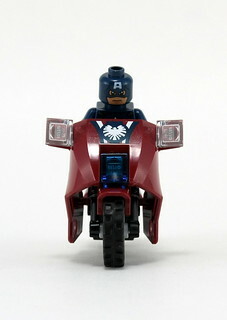 If you really want a fig who's the lighter LEGO blue, with stand out details and an oversized helmet I have a picture of what that would like. Like I said, the darker blue may be more film accurate (though having just rewatched Avengers, it's an iffy point), but on a LEGO figure it just completely washes out the detail and makes it all just blend together. The standard LEGO blue isn't that bright, and I think would've complimented the other colors well and brought out the detail. As for the head, I don't think it's fair to compare him to figures like Spider-man or Deadpool because those are full facemasks, while Captain America wears a cowl. I'll grant it might've been entirely possible to screw it up (Iron Man does show how that method can backfire), but if kept small enough, say, on the level of your average minifigure helmet, it wouldn't have looked comically overdone. As it is, I think he actually looks out of place amongst his fellow Avengers, being the only one that doesn't have some sort of head piece or hairpiece (excepting Hulk, but then he's also four times as big, so I think he's fine as a general exception). A slightly brighter blue and a helmet don't mean we would've gotten a Reb Brown Captain. I never said that the dark blue was movie accurate, I said the movie uniform was somewhere in between. I just think they went the right way as standard LEGO blue matches the comics better like the new Spider-man fig. If Cap had been too bright he would have stuck out with all his dark red, dark grey and black teammates. Agreed, but wouldn't you know it that's the one Pharaoh's Quest set I didn't get. 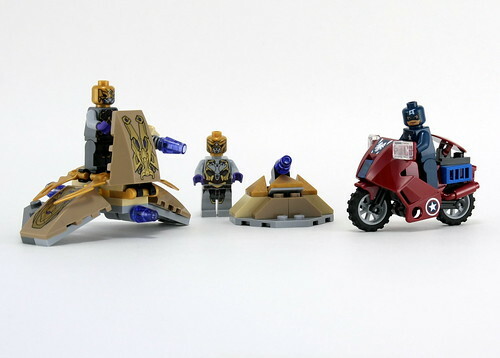 Bright side is if no one wants to trade the set's only $7 at TRU (if you have one in shippable range of course) and the lowest price for the bike itself on bricklink is $2.84 with no min buy (well $3.50 if you're in the US). Also it comes with the new Monster Fighters set 9464 The Vampyre Hearse. buriedbybricks wrote: How he looks next to the others is a moot point. buriedbybricks wrote: If Cap had been too bright he would have stuck out with all his dark red, dark grey and black teammates. So the uniformity is something to take into consideration. How he looks compared to figures he's not supposed to be compared to (Iron Fist, Spiderman, etc.) isn't. 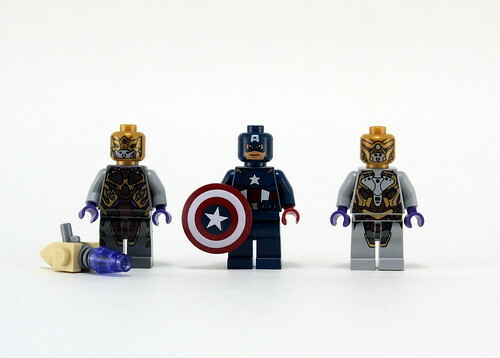 And accuracy has always been irrelevant when it comes to LEGO figures, so I don't see why it would factor in here-- I mean, none of the Avengers are particularly short and stumpy, so why the Cap's cowl/mask/head thingie should be 100% accurate to its appearance in the movie is beyond me. 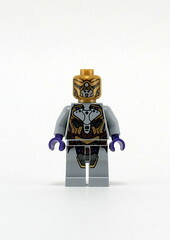 As it is, I don't think it looks terrible, but I do think it would just look better as some sort of separate piece (and as I said before, that would also give us the advantage of another re-usable fleshie underneath (though knowing LEGO, it would probably just be another Bruce Wayne lookalike)). 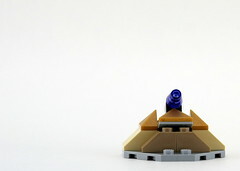 As for the blue, I do think you overestimate how bright the LEGO standard blue is. 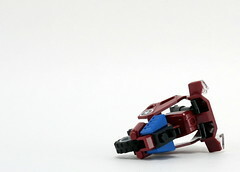 If you look at Kaminoan's custom Captain America figure, he uses the standard blue and it looks fairly good; there's another Flickr user who basically transposed the LEGO figure onto a standard blue and it looks really nice. I don't think it would've stuck out too much when compared with the other Avengers. As it is, the dark blue just washes out almost all the detail on the fig (and I'm presuming is probably the reason for the odd tan he has as well). Those were two seperate points, but I can understand if you couldn't keep them straight. The first point was moot because you were comparing the look of characters with flowing hair and actual helmets to one with a skin tight mask (apples to oranges) and the second was about the colouring of the characters which still looks better in the darker shades LEGO chose. I am well aware of how bright standard LEGO blue is and as I said it should be saved for the character's four colour comic counterparts. You may be closer to the target demographic, but not close enough to see that it *does* matter how those characters relate and compare to each other even to characters from DC. If there is no *reason* for them having a seperate part for a helmet like ears, a flip up face mask or something of the sort then it is unreasonable to expect it simply because you want another face. A face which would most likely resemble many others as that is how they are drawn and Steve Rogers certainly has no specific features that would seperate him from dozens of other comic characters (aside from eye and hair colour). To say that accuracy is irrelevant is condescending and an insult to the amount of work and detail the designers put into making these little figures look as close to the source material as possible. The level of detail has risen steadily in the last few years (for better or worse) and harping on the shape of the figure LEGO chooses to go with is another moot point. Kids want Captain America, who does not wear a helmet and you want some generic blonde dude that does. Sorry about your luck. 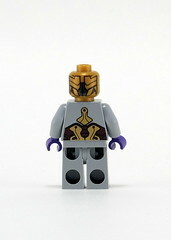 The only interesting thing I've gotten from your original complaint is that the minifig is all you saw fit to mention at all, when you are usually the one complaining that all people care about these days is the minifigs, not the sets they're in and what a sad state of affairs that is. buriedbybricks wrote: Those were two seperate points, but I can understand if you couldn't keep them straight. No need to be condescending. I misspoke when I said accuracy is irrelevant and I apologize for that. What I probably should have said is accuracy is not as important a factor when it comes to designing sets, and especially when designing minfigures due to their inherent inaccuracy to real people (being short, stumpy, and for the most part disproportionate- that's part of their charm). So yes, accuracy is something to take into consideration, but not over other elements (such as how it stands out as a toy, how it fits with the LEGO aesthetic, etc.). The darker blue may be more accurate, but I think as a toy the brighter blue just works better, and, my original point- it brings out all the detail much better, as it just washes out in the darker blue. As for the head, I think you're misreading my argument- I'm not saying we should've gotten a helmet just so we get another fleshie face- both of us have commented on the silliness of that argument. I'm saying that the figure with a helmet would just look better than it does without. As is, it feels to me just incomplete, like it's missing something, and I think when compared with the rest of the Avengers it's because of the lack of any exterior armor piece, hairpeice, helmet, what have you. It's not a matter of accuracy, it's a matter of me thinking he looks incomplete, especially when compared to the rest of the group. As for your last point, I brought up the figure because it was the one point in your review I disagreed with- the rest of it I found spot on, so why comment on what's already been said? We're discussing the qualities of this figure because we disagree, not because it's the only thing in the set we care about (I mean, that's what these discussion forums are for, anyways). Hello! Can I ask where I can get the red bike you had in the picture? Please e-mail me when you can [email protected]. Thanks!